Every purchase of Pure Argan Oil helps contribute to the Marocavie Association a foundation setup by companies to promote sustainable development and who aim to help support the Argan communities in Southwest Morocco. The main objective of Marocavie is to improve and facilitate the education of the children and this is very much an ongoing process in the Biougra and Essaouira Regions of Morocco. The organisation also aims to combat the spread of the Sahara desert which slowly crawls in the Souss region. Free of any religious, political affiliations or commercial influence, Marocavie is financed by companies that pay a percentage of its turnover for every kilo of oil sold. Every time you buy a 100ml bottle of Pure Argan Oil you indirectly contribute to the Marocavie Association. With a population of 1300 consisting of 108 families, the Izkritne village has recently benefited directly from the Marocavie Project. The association supplied and fitted a new water pump that helps villagers draw water from a well 170 metres underground. Not only did Marocavie help in this instance, they helped train the local villagers to maintain and operate the newly fitted equipment. The well start to flow at Biougra, the first drops of water. This new well will help irrigate land which has been dry for five years. Helps combat the spread of the Sahara Desert. Allows farming and teaches locals new farming skills to help them meet their food needs. In a desert region of Morocco lies the village of Ait El Hamri. Currently the region has five primary schools with a totalof 343 school pupils. 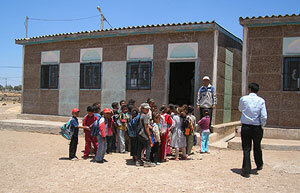 Marocavie has supported these schools by purchasing school furniture and constructing two toilets. Ait El Hamri has electricity however the schools are not connected, Marocavie plans to pay for this connection. From 2008, Marocavie purchases academic and health reports, to monitor the children’s education and ensure priority access to free health services.